There are nearly 1 in 200 Americans living with IBD. 70,000 new cases are diagnosed each year. 150,000 (about 10 percent) of people with IBD are children under age 18. Most people develop the diseases between ages 15 and 35. Children under 18 are the fastest-growing patient population and are often the most severely impacted by the diseases. 163 genes associated with IBD have been discovered, but their functions are still unknown. Symptoms may include abdominal pain, persistent diarrhea, rectal bleeding, fever, weight loss and fatigue. Many patients have complications affecting other body parts—anemia from blood loss, inflammation of the eyes, joint pain, and more. 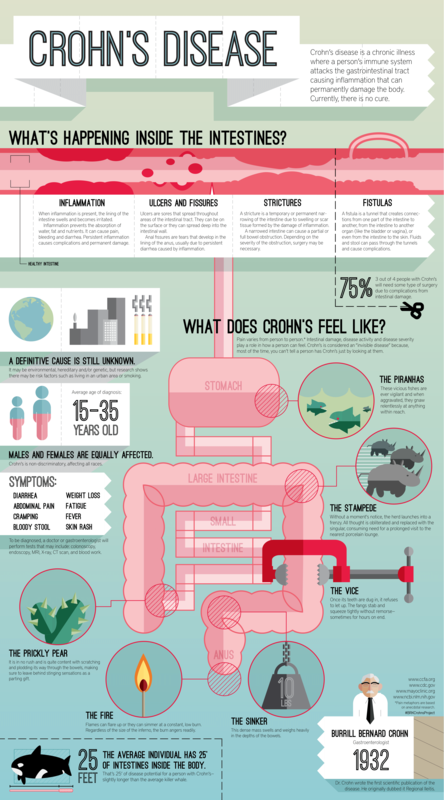 Approximately 20 percent of patients have another family member with Crohn’s or colitis. Where is a picture for Colitis?